You have to help the carrot to escape all these undersea monsters! It is not so easy as it seems to be at first, so hurry up and help him! Set the weapon that will kill all creatures and try to win each level. Show us all your skills! This cure carrot really needs your help! As you have understood your main goal is to protect a carrot from various creatures. Be very careful, cause each of them has different characteristics, so be careful and try to build as many watchtowers as possible. 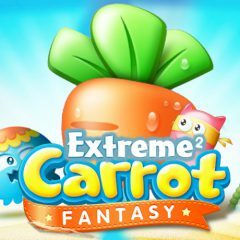 That is why defend your Carrot from undersea monsters by building various weapons along the enemies path to help slow down and destroy the enemies. You can also upgrade your weapons to make things easier! Don't forget to destroy surrounding objects as they may be hiding secret weapons. We know that you will cope with it. Have much fun!